Lush, haunting, soulful Americana music with lyrics to make you think and vocals to make you feel. Hilary Scott writes songs with lyrics that make you think and melodies that stick in your head. Scott is also a multi-instrumentalist whose voice was described by The Columbia Daily Tribune as an “embarrassment of riches” . Remo Ricaldone of Planet Italy says, “Hilary Scott...has self-produced an inspired and vibrant album that can be placed along-side the great female voices of American song, from Carole King to Karla Bonoff”. Don’t Call Me Angel represents some of Hilary’s finest songwriting. The album highlights Scott’s storytelling skills and her ability to evoke deep emotions in the listener, and delves more into the realm of soul and blues. In Don’t Call Me Angel, Scott uses her voice and her sense of hope, humor, and a lot of soul, to shine a light on the beauty found in humanism in each and every track. As Mike Davies, Folking.com says: ”Quite simply, it’s one of the best Americana heartbreakers I’ve heard this year”. 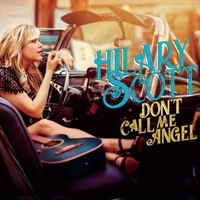 Hilary Scott (“with one L”) received rave reviews in No Depression, Country Music News International, Maverick Magazine and more for her 2014 release, Freight Train Love, and an interview with Chuck Dauphin in Billboard introduced much more of the world to her sound...and to her story. When Hilary’s older brother died suddenly in 1998, she took his first name—Scott—as her performance name. Her 12th studio project, Don’t Call Me Angel is releasing on the 20th anniversary of his death, and is an incredibly poignant project for Hilary. Hilary was fully in command of this project, acting as producer and also hand-picking studios and musicians with whom she wished to work. Joining her as the core ensemble for the record were her husband and percussionist AJ Gennaro, plus guitarist and longtime bandmate Josh Schilling. The three of them recorded all of the rhythm tracks at Sawhorse Studios in St. Louis. Having worked previously with the multi-Grammy-award-winning Johnny Lee Schell at Ultratone Studios in Studio City, Hilary knew she wanted to spend several days with him focusing on recording vocals and arranging harmonies. Johnny Lee Schell (guitars) and Mike Finnigan (Hammond B-3 organ) - who have toured and recorded with artists as varied as Bonnie Raitt, Jimi Hendrix, Leonard Cohen, Etta James, and Taj Mahal, to name a few—appear on more than half the songs on this record. Hilary Scott’s career has included co-writes with some of the best living songwriters, tours in the U.S., U.K., Europe and Asia, various awards, and the release of a dozen albums. Recently, her single “Still” has been receiving significant radio and satellite airplay.